Today, I will donate the money I would’ve wasted on eating my way out of boredome to OzHarvest. Today, my household will donate $348.87. Add $70 to that and you get the amount on money we spent on food the week before. Scary. I just want to say a massive thankyou to everyone who blogged, tweeted, commented and participated in the inaugral $35 Challenge this year. I want to thank those regretfully declined. We’ll be back next year, bigger and better than ever, and I hope you’ll join us. I really, really do. I’m still musing on it, you’re probably sick to death of hearing about it, but there you go. Day 7 of the $35 challenge and it’s time to sit back and reflect. The $35 Challenge is not just about denying yourself, and it’s not just about raising money. The most important part of The $35 Challenge is that old cliché – putting yourself in another person’s shoes. It’s about experience, and more importantly, what you learn from that experience. Here’s what have I learned. There is power in numbers. This is the most powerful lesson I learned. There is power in numbers when we all come together and decide to make a difference. On a more practical note, there is power in numbers in terms of the size of your household. The more helping hands you have, the easier it is to get by. Also, on a per-head basis, costs go decrease when they are shared. Don’t underestimate what you have. I mean this literally – look in your cupboards. Look in your fridge. I cannot tell you how many times this week I thought we didn’t have enough food and then managed to sort something out. I thought we were out of food for tonight’s dinner. I was a little bit nervous, it was not a great feeling. But I found veggies, eggs, rice, tofu and lemons and tonight I will cobble together another fried rice. It will be of the 2/3 veggies, 1/3 rice variety. It may not blow anyone’s mind, but it will probably be very tasty. Don’t underestimate yourself. We’re all tired. We’re all busy. But I can’t see how we’re too busy to make a tuna sandwich. Or scrambled eggs on toast. Or a salad. Or this soup. Making do with what you have, not wasting a thing – these are old-fashioned lessons we learn through having very little. But they would still serve us well when we have more. Frugality is having a comeback. Jump on the bandwagon. Be thankful (but not complacent). Bloody hell, the list of things I am grateful for right now would fill a book. I have a roof over my head. I can have espresso any time I want. I have privacy, freedom, dignity. When I walk down the street, I don’t need to beg for money. People don’t abuse me for being a drain on the public purse. I have an education. I have family and friends I can turn to for help. I can do something to help. I have something to contribute. Give generously. Organisations like OzHarvest run on generosity. They run on donations of time, food and money. If you are a business with excess food going to waste, get in contact with OzHarvest. If you have a teensy bit of cash to spare, donate to OzHarvest. If you have time, volunteer. There are people not so very far from where you live who rely on these organizations. They shouldn’t have to, but they do. And until systematic change provides some kind of safety net, we need to do what we can to help. I have to say thank you to everyone who has helped with The $35 Challenge this year. By participating, blogging, tweeting and donating, you have all made a big difference. Join me next year during anti-poverty week and we’ll do it all again. What have you learned from The $35 Challenge? The $35 Challenge, where we have just $35 to spend on a week’s worth of food and drink, is drawing to a close. And while it hasn’t been as hard as I thought, we are getting to the point where were actually running out of food. Or so it seems. Eating last night’s dinner for lunch will be impossible tomorrow, because today, dinner is steak and mash. Discount rump steak that’s been sitting in the freezer for a week, waiting for this very day. The day when I can’t be arsed to chop more than a potato and some beans. But what of our tomorrow-lunch? As usual, the answer is leftovers, but not in the way you’d think. This time, I’m taking all the disperate leftover bits and bobs we’ve accumulated over the week and making them into (hopefully) a tasty dish for tomorrow. 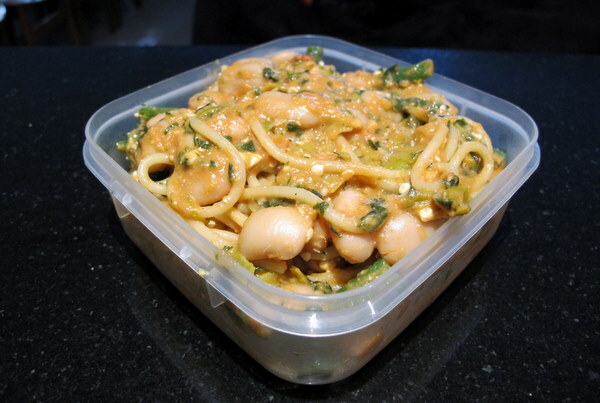 Basically, I cooked the spaghetti and green beans, stirred everything else through it and bunged it in a container for tomorrow. It’s not the most incredible meal in the world, but it’ll have to do. What about you? Do you ever throw all your leftovers together in this way? Day 5 of The $35 Challenge sees me a tad tired of coming home from work and having no choice but to make dinner (and tomorrow’s lunch) from scratch. Don’t get me wrong, I cook dinner at least 5 days a week but sometimes that could be just grilling a steak or making a salad. I haven’t chopped this many veggies on a regular basis since I was vegetarian. I’ve been saving a treat for later in the week, knowing that we were going to get sick of veg-heavy meals. Maybe it wasn’t a great idea as piza is a bit labour intensive, but I sucked it up and got on with it. 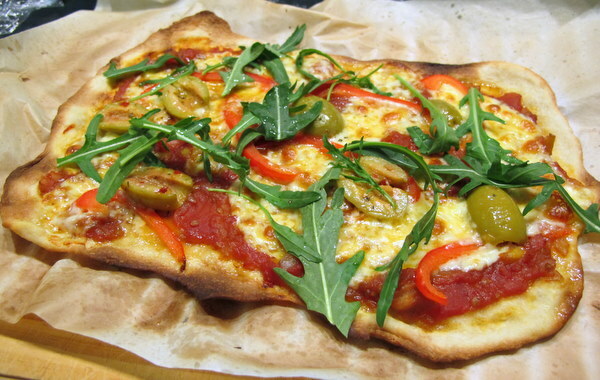 This meal is the ultimate in frugality- it takes one portion of pizza dough (care of The Australian Women’s Weekly) and divides it into three so-thin-you-can-cut-them-with-scissors pizzas. Combine yeast, sugar and water in a small bowl. Cover, stand in a warm place for about 10 minutes or until very frothy. I usually have to put it in my oven on its lowest setting. Put flour and salt into a large bowl; stir in all other ingredients with your hands. Mix to a soft, sticky dough. Knead dough for 10 minutes/until smooth and elastic. Oil the bowl you mixed the dough in and place the dough in. Cover with cling wrap, stand in a warm place for about 1 hour or until doubled in size. Preheat the oven to 250◦c/220◦c fan forced (I have a pizza stone in mine). Punch down the dough, knead until smooth and then separate into three even balls. Let sit for 10-15 minutes. Roll out one of the balls, place on greeaseproof paper and top as desired. Don’t go nuts on the toppings or you’ll weigh your pizza down. 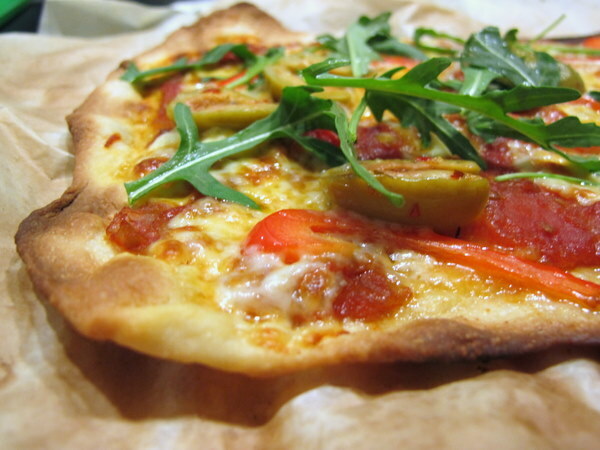 Place the pizza, on the paper either on the bottom of your oven, the baking rack in the oven or on a pizza stone if you have one. Tip: Each pizza should take less than 15 minutes to cook. Keep an eye on it or it will burn! Be sure to leave about 10 minutes between pizzas to reheat the oven properly. What’s you fave homemade treat? Day 4 – What are you eating? We’re four days into The $35 Challenge and still going strong. The support in the blogosphere/twitterverse has been fantastic, and while we may not raise a ton of money this year, we’re definitely raising awareness of poverty. I am planning to run the $35 Challenge every year during Anti-poverty week so hopefully it’ll just get bigger and better. If you can’t do it this week, why not next week, or the week after that? It’s never too late, drop me an email and I’ll add you to our tally. Or, if you donate to OzHarvest for the $35 Challenge, let me know. Yesterday Emma over at Love Thy Kitchen posted an update on what she’s been eating so far. By the second day she’d spent only $8 and doesn’t feel like she’s going without, and I have to say, neither do I. If anything my household is eating healthier than usual this week. Everything is packed with veggies, and I’m squeezing the last ounce of flavour out of every meal. My cooking is also a hell of a lot more creative. I made this salad which came out of nowhere and blew my mind. I keep forgetting just how much limitation breeds creativity. Every day I’m eating last night’s leftovers for lunch, and it’s fine. It’s not amazing, but fine. And I’m loving how when lunch rolls around I don’t have to think about what I’m going to have and how much it’s going to cost. 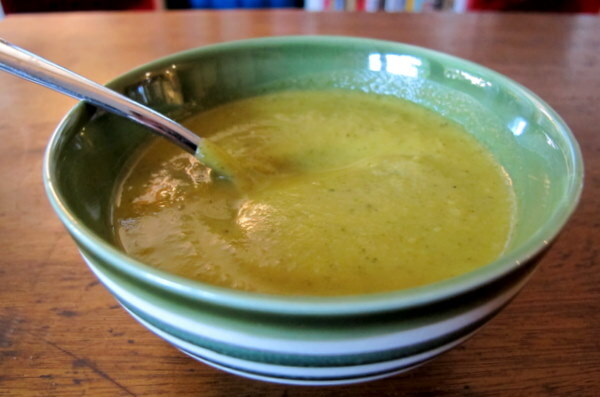 Suddenly I can’t bear to waste anything – last night, old broccoli became broccoli and ginger soup. This was while I was making dinner. Now there’s soup sitting in my fridge, rather than old floppy broccoli I could justify chucking out in a couple of days. Heat the oil in a medium saucepan. Fry onion and ginger with a pinch of salt. Once they start to colour, add the carrots and potato and cook for a couple of minutes. Add all remaining ingredients, almost covering the veg with water. Put the lid on the pan and simmer until all veggies are well cooked. Take the pan off the heat and blend the soup with an immersion blender until smooth. Heat to thicken and serve. You can read about Emma from Love Thy Kitchen’s take on the $35 Challenge here. She’s costing it down to the cent, I really applaud her commitment. You can also read more about the nuts and bolts of the challenge here. Yesterday I was interviewed for 612 ABC Brisbane by the lovely Emma Sykes. The interview went to air this afternoon. If you missed it, you can listen to a podcast here. Thanks so much to Emma and the ABC for helping promote The $35 Challenge! Yesterday afternoon, in the midst of wishing I could run out and grab a coffee I got an email from Luci, a woman living on the disability pension. Luci feeds her whole family for $100-$150 each week. All 7 of them. That’s $14-$21 per person, per week. Sure, shared food costs may help – the cost of food for a family of 4, for example, is less per person than for a single person living alone. But $150 to feed 7 people is nothing in Australia, especially with the increase in cost of living. As is true of so many things, Luci and her family pull it together each week through their own ingenuity. They’re not starving, although she admits that things are getting harder as food gets more expensive. My hokey little ‘taste of poverty’ challenge is not something Luci, or her family can afford to try. However, she wasn’t critical of it, even though I am coming from the privileged position of being able to ‘play’ at being poor for a week. These kinds of situations are exactly what I’m trying to raise awareness of. 11.1% of us live below the poverty line. 2.2 million Australians go without the basics we consider essential to live, not even a comfortable, but a not-hideously-uncomfortable life. With this in mind, I invite you to donate to OzHarvest today. If you do, please comment below or email me at lau@corridorkitchen.com so that I can keep track of the $35 Challenge tally. It’s not too late to support The $35 Challenge. During Anti-Poverty Week, from October 16-22, participantshave $5 a day to spend on food. By experiencing poverty for just 7 days, we come to a better understanding of the realities and stresses of those living in poverty. By blogging or tweeting this experience, we can raise awareness of an issue so often swept under the rug. And by donating the remainder of the money we would usually spend on food to OzHarvest, we can make a real difference. 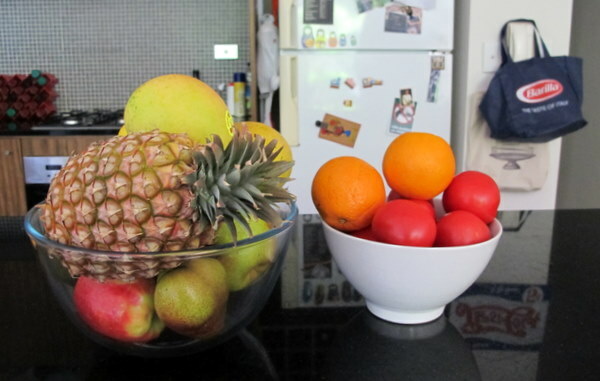 I chose this image as I doubt I’ll ever see so much fruit in our apartment ever again. Yesterday, we grabbed the few grocery store items we needed at woolies. This was relatively stress-free as the number of things we needed was dictated by our budget – $35 x 2. At woolies we spent about $18 and this got us cottage cheese, 2 litres of milk, tinned tomatoes, 59 cent spaghetti, frozen spinach and not much else. It took all of 10 minutes and at this made me wonder if maybe extreme cost cutting is the way to go. However, this morning at Paddy’s Market (Haymarket) was more of a trial. We only had one shopping bag with us and I had decided we needed to buy heaps of fruit because we never eat fruit so now is obviously the time to start. We spent about half our budget there and walked out with more fruit and veg than we could carry. I wondered how we’d feed ourselves on such a budget if we didn’t have a really cheap market nearby. I knew this would be a hard day, mostly because both Senhor R and I are exhausted. Also because I hate going to Paddy’s Market’s to buy fruit and veg almost as much as I hate exercise. When we got home, we realized there was just over $16 left in our budget and we were out of coffee. The coffee we buy that costs $13. And we still hadn’t bought any meat. At this point we were at each other’s throats but we finally bought steak for $5 and downgraded to the $12 coffee. Yep, that’s right the challenge is already technically broken – I have spent $35.50. After Senhor R had his coffee and things calmed down, I decided it was time for a massive serve of some of the fruit and veg we’d just bought in the form of a salad. This is a great summer salad, everything is really finely chopped and you get all these different textures – from mushy mango to crunchy macadamia and everything in between. I served it with a massive black sesame rice cracker we had in the pantry, but it’s fine just as it is. You don’t have to stick to what I used – you can sub in or add ingredients like red onion, cucumber, pineapple, lime juice, red basil, spring onions, grilled chicken, nectarines, tuna, cannellini beans, cashews, peanuts…the list is endless. Put all the salad ingredients into a large bowl. Stir the dressing ingredients together. Pour over about half the dressing and stir the salad well. Serve immediately. What grocery item can you just not live without? The $35 Challenge has only just begun and I’m already feeling the pinch – isn’t that pathetic? The weekends are usually times we spend doing what we like and eating what we like, telling ourselves it’s a reward for a hard week’s work. Usually Senhor R and I will eat out a few times, grab a few coffees and spend an evening or afternoon in the pub. Harmelss weekend fun. But it’s becoming all too clear to me that food and eating are my main pastimes. There isn’t anything wrong with food as a hobby, but eating? I’m not so sure. I can’t help but think back to times when I was less well off – I ate healthier than I do now, which flies in the face of almost every statistic on poverty and nutrition. And having just spent a week in bed with a head cold and resulting middle ear infection, I can’t help but think Senhor R is right when he points out that my current lifestyle isn’t really the path to a strong immune system. I have been productive though. I’ve scoured the freezer, fridge and pantry and put together a veg-heavy menu for this week. It’s really made me appreciate the stuff we keep on hand. It’s the starting point for any meal. These are my 5 pantry must-haves, a pretty dull, but essential list. If I’m at a loss for what to make, pasta takes 10 minutes to cook and goes with pretty much everything. I usually buy Barilla spaghetti no 5, but this week on the $35 challenge I’m testing out a 59 cent pack of spaghetti from woolies to see if my brand loyalty is warranted. If you have tinned tomatoes, you have an amazing tomato sauce. Just fry some onions and garlic, add the tomatoes and a slosh of wine and simmer for up to an hour. Add a pinch of sugar at the end and it’s perfect for pasta, pizza or even on toast. I wait until it’s on special and then buy one of those massive 4 litre tins for about 20 bucks. If I could only have one kind of oil, this would be it. As it stands I currently have canola and sesame as well but they’re really just extras. It’s the rice with the lowest GI and also the easiest to cook. 1 cup of rice with 1½ cups water simmered for 20 minutes with the lid sealed tight and then left to sit for 5 – perfect every time. Just stir fry some veg and meat while the rice cooks. This is my breakky staple whenever I’m skint. It’s also the key to ANZAC bikkies. Find my porridge recipe below. On the back of a packet of oats they’ll tell you porridge consists of chucking equal amounts of oats and water into a pan and simmering until done. For me, porridge is more akin to risotto. I put the oats in a pan and then add a good slosh of water. Give it a stir while it simmers and once the water is soaked in, add some more and if you’re adding dried fruit, nuts or fresh banana, do so now. Keep adding water and stirring in until you’ve got the consistency you’re after. At that point, stir through some milk and turn off the heat. 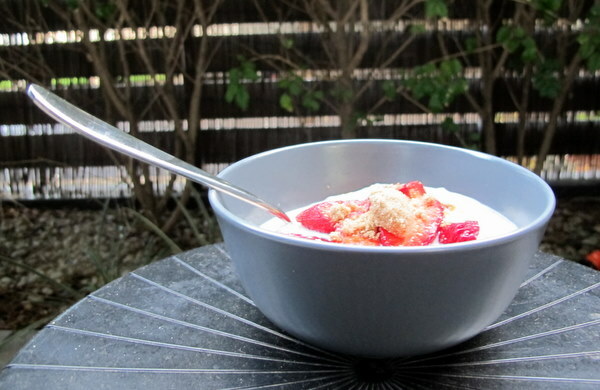 Serve immediately with a slosh of cold milk, a sprinkling of brown sugar and whatever fresh fruit you have on hand – in my case, I used strawberries but you can use blueberries, pear, banana (although I like to add bananas early on so they get mushy) or whatever you fancy. What are your pantry must-haves? I don’t know about you, but I don’t plan on dying of some kind of vitamin or mineral deficiency in the next week. Sure, I could complete The $35 Challenge on nothing but mee goreng, oranges and beer, but that’s not really a sensible way to play it, and I’m nothing if not sensible. Below are my top ten tips for menu planning, your money and sanity saver. And not just during The $35 Challenge. I just did and there is waaaaaaaaaaaay more stuff in there than I realized. 4 kinds of rice, three shapes of pasta, tins of tomatos, legumes, beetroot, pineapple, tahini, enough condiments and sauces to open a deli, at least 18 different spices and various baking ingredients – sugars, flours, cocoa, almond meal, rosewater, vanilla pods…the list goes on. Any and all of these things can form the starting point for a menu, so take a quick look in your cupboards. Before I write a menu, I so often make the mistake of not checking what’s in the fridge or freezer. More condiments. A dozen eggs. Half a kilo of greek yogurt. Five kinds of cheese? All that’s really needed is a shitload of veggies and some meat and I should be able to sort out at least 5 main meals. Here’s how you do it: write down every meal you’re going to eat. Then write down every ingredient you don’t already have which is in that meal. Then add anything else to your list that’s not technically part of a meal – snacks, fruit, cleaning products etc. In fact, why not just write down everything you ate last week as a starting point? Maybe you eat all your lunches out and have toast for breakfast every day. In that case, a menu would just cover dinners. Maybe you order takeaway once a week? This doesn’t have to change, just pencil it in.Suddenly, your shopping list is done. I prefer to shop once a week, so I write a menu once a week. This is a trick I learned from my mum and it’s what has always worked for me. I find fortnightly shops mean I end up with stuff going off or getting forgotten about, and shopping every few days means I end up making a lot more impulse purchases. Find what works for you and stick to it. This is key. You need to be realistic about what you’ll cook, how often you’ll cook and what you’ll actually eat. There are a few dishes that crop up again and again on my menus but never get made because they’re either too boring (chick pea stew anyone?) or too much effort come 6:00pm on a Thursday evening (yes, I will stuff and roast an entire chicken on a week night, without a recipe). Make it easy on yourself. Taste.com.au publishes a monthly list of all the fruit and veg in season. It’s often a good idea to have a look at something like this before you decide what to cook as it will give you some idea of what will be available, tasty and cheap. Maybe you thought you’d serve grilled fish with mashed potato and green beans today – that’s what’s on your menu. But when you get to the supermarket, asparagus and pumpkin are on special, so you change your plans accordingly. Flexibility should also apply to when you want to serve something- just because your menu says taco Tuesday doesn’t mean you can’t switch it to Wednesday ‘cause your plans have changed. In my case, I don’t allocate specific days on my menu – my menu is just a list of meals in no particular order. Try and prepare one new dish a week or, failing that, try one new ingredient. Or, use an ingredient in a new way. This will stop your taste buds getting bored. Until recently I’d never really cooked steak or fish (I was vego for 10 years). A few weeks ago I finally tried pineapple as a savoury ingredient when I made this pineapple salsa. Try new things whenever there’s time or the mood takes you. 9. Stop asking yourself ‘what do I feel like eating today’? If your menu is realistic, flexible and varied, you won’t need to ask yourself this question each day or for each new meal. By taking choice out of the equation on a case-by case basis, you’ve also taken out the work. Once menu planning is a habit, you’ll never look back. Chances are no matter how meticulous your planning, you’re going to have a few things left at the end of the week. Maybe you didn’t make one of your meals or maybe you just ended up with too much of something. Either way, you can probably whip something up with what you’ve got. Then you’re all ready for your next menu. It’s not too late to support the $35 Challenge. During Anti-Poverty Week, from October 16-22, participants have $5 a day to spend on food. By experiencing poverty for just 7 days, we come to a better understanding of the realities and stresses of those living in poverty. By blogging or tweeting this experience, we can raise awareness of an issue so often swept under the rug. And by donating the remainder of the money we would usually spend on food to OzHarvest, we can make a real difference.